SOUTH Western Railway has accused the RMT of ‘ensuring maximum misery’ by calling a fresh 24-hour strike on 22 December. The operator also rebuked the union for ‘scaremongering’ over railway crime figures. The union has claimed that SWR has ‘refused to make any progress’ in the continuing dispute over on-train staffing. RMT general secretary Mick Cash said: ‘The company are hell bent on opening up a loophole that would allow them to run services driver only at their discretion. SWR responded: ‘By targeting the last Saturday before Christmas when people are trying to travel to be with family and friends the RMT is ensuring the maximum misery is inflicted at what should be a time of relaxation and enjoyment. ‘This action is totally unnecessary. We have guaranteed to roster a guard on every train, and we need more, not fewer guards – 70 more by May 2019 – and we have an opportunity with the introduction of the new suburban trains to operate these trains differently to maximise the customer benefits. ‘The RMT is scaremongering by using crime in its statement. 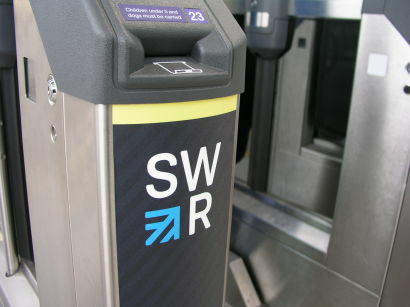 The number of crimes on the SWR network has reduced by nearly 6 per cent since April. SWR’s team of 35 Rail Community Officers work on trains and at stations to prevent and detect crimes. They work closely with BTP officers to help reduce incidents on the network, engaging with customers and highlighting suspicious activity. Meanwhile another strike has started on Northern, as the latest in a series of Saturday walkouts by the RMT. A fresh bid to end the Northern dispute failed last week, when the RMT offered to cancel the outstanding strikes so long as Northern agreed to conditions set out by the union. The hopes of peace had also risen when both the Department for Transport and Transport for the North said they supported the presence of a second staff member on Northern trains. Recent failures to resolve both disputes have often been caused by disagreements over when, if at all, it would be acceptable to run a train with only a driver.